Jewelry, Affordable Luxury, Coins Online and Discovery – Interiors Online featuring 20th Century Design, Home Furnishings and Artwork, September 8 – 16 | Skinner Inc. Artist and studio jewelry including a Faberge 18k gold and diamond locket; a Lalique glass domed ring; Angela Cummings sterling silver earclips and brooch; Hermes cuffs and enamel bangles; and Cartier silver rings and necklaces. A wide array of women’s timepieces by such makers as, Isaac Ruegger, Michel Herbelin, Tiffany and Co., Boucheron, Jaeger-LeCoultre, and Longines. Charles-Gigandet/Wakmann, and Heuer Autavia “Viceroy” and “Andretti” chronograph wristwatches, within a large collection of men’s time keepers. Pieces with old world charm and glamour, such as 10k and 14k gold-tipped walking sticks, an Hermes vermeil travel vanity, and sets of Montblanc, Waterman, and Parker fountain pens. Over 100 lots of gold and silver coins and artistic medals highlighted by a Paul Manship “Hail to Dionysus” bronze medal. 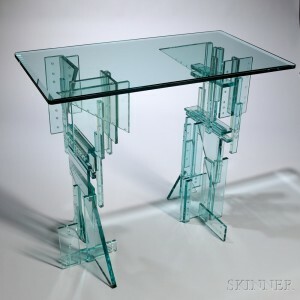 A standout selection of 20th Century Design with furniture by Eames, Charles Webb, Stickley; a Fay Miller glass skyscraper table; art glass from Steuben, Tiffany, Daum, and Lalique; and art pottery by Mary and Edwin Scheier, Dedham, and Rookwood. Early American decorative arts and furniture including armorial Chinese export porcelain, Staffordshire historic blue tableware, and Queen Anne, Chippendale and Federal furniture. English Victorian art glass, porcelain dinner services by Royal Crown Derby and Christofle, and sets of Meissen and Herend plates. A collection of artwork highlighted by an Emilio Vedova signed charcoal portrait, a Louise Nevelson graphite on paper study, and works by Edna Hible, Lu Stubbs and Leighton Cram. All lots offered at Skinner may be viewed online or in person, and specialists are available to answer questions, setting our auction house apart from internet-based auction companies. Previews for the Discovery-Interiors online auction are open to the public and will be held in our Marlborough, MA gallery on Tuesday, September 13th from 12PM to 5PM and on Wednesday, September 14 from 10AM to 7PM. View driving directions. 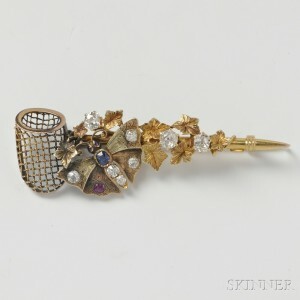 View catalogs on the Skinner website, and log in or create an account to start bidding. Each lot in the online catalog displays the current bid, asking bid, and time remaining in the auction, in addition to detailed images and condition information. Place a bid for the next bidding increment, or place a maximum proxy bid and the system will automatically bid competitively up to that price. Specialists are available throughout the auction to answer questions and provide additional information about the lots offered. Lots begin a staggered close on Friday, September 16 with Jewelry, Affordable Luxury, Coins starting to close at 10AM and Discovery-Interiors starting to close at 3PM. This entry was posted in Blog and tagged 20th Century Design, antiques, art, art glass, artwork, auction, coins, collectibles, currency, decorative, Discovery, discovery auction, ephemera, estate auction, furnishings, furniture, Heidi Pribell, home decor, jewelry, marlborough, massachusetts, mid-century modern, online auction, silver, skinner, Skinner auction, timed auction, watches by Skinner. Bookmark the permalink.